Marmalade 2012 is in stock NOW! Arlington Garden’s 48 Washington Navel orange trees have become more than a colorful representation of Pasadena’s past. In 2010, they decided to make orange marmalade from the orange crop. The marmalade, made by E. Waldo Ward of Sierra Madre, was a smash hit. They sold some 1,200 ten oz. jars in just 4 months, using word of mouth alone. 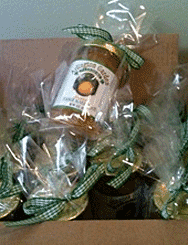 And now this locally grown and processed fine marmalade is available right here at Bellefontaine Nursery! Bellefontaine Nursery is proud to announce we are now carrying Bee Bar® from Honey House Naturals®. We believe you will agree that the product is "a serious treat for dry skin." Moisten and mend dry and gardening damaged skin by enveloping it in the warmth of lush shea butter and dew drenching, vitamin rich oils. When chemical treatments fail, return to the tried and true remedies of nature's own skin sustenance. Restores summer heels to velvey smoothness and soothes irritating winter itch to calm suppleness. Waterless and greaseless. Otis and Sally Marston met and married during their college years. They both had a passion for creativity -- Sally's passion was planning and planting gardens and Otis's passion was creating innovative and delicious dishes. Their pursuits eventually led them to create and run Marston's Restaurant which opened in Pasadena in 1988.Their rightfully famous San Pasqual Salad Dressing is now being sold at Bellefontaine Nursery!